Ride the Heartlake City waves on the water scooter! 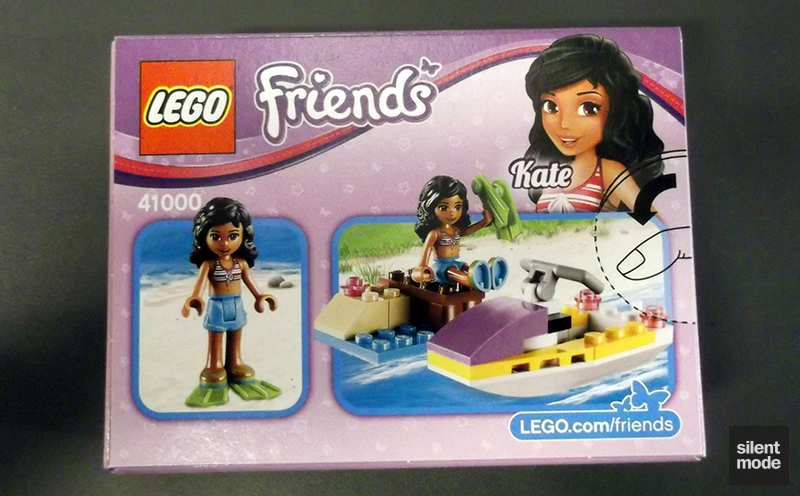 Olivia’s friend Kate is aboard the colorful water scooter and exploring the beaches of Heartlake City. Head over to the buildable dock and ride out into the surf! Cruise over the waves and make a splash! Then put on the flippers and explore the ocean. Includes Kate mini-doll figure. Store the flippers in the water scooter! Welcome back to SilentMode.tv, and I’m very proud to bring this semi-exclusive review of one of the new Friends sets for 2013. Before I begin, shout out to Brickset for helping me fill in some of the gaps. At the time of writing this set isn’t out in the UK, so how did I get hold of it for this review? Very simply: I was on the way back from a short vacation in Iceland, and they had some of the 2013 sets in a duty free shop. I couldn’t pass up the opportunity, both as a reviewer and a fan of the Friends theme, so I bought three of the sets that were available. This is the first of them, and also the smallest. These pictures were taken with a point-and-shoot camera, rather than my decent camera, as it was done at the airport. That point-and-shoot camera will never be seen again. 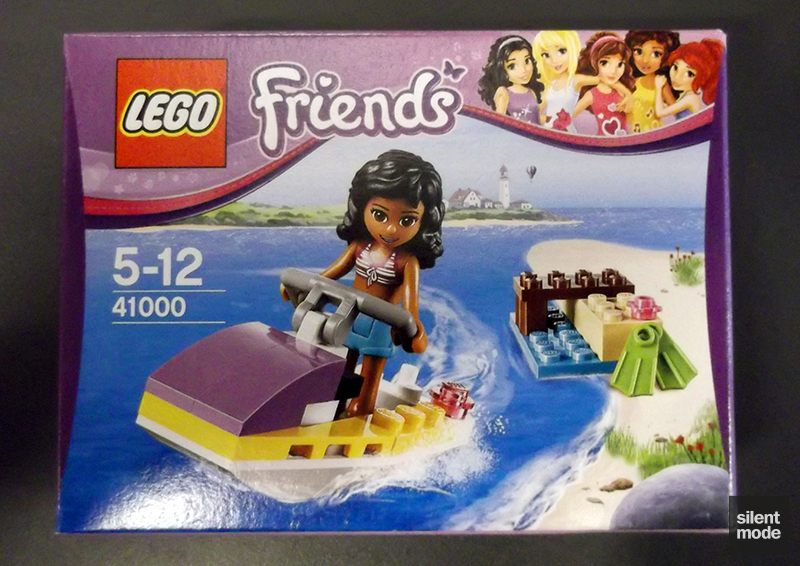 So here we’re presented with a dinky little box, roughly the same size as Emma’s Splash Pool and Stephanie’s Bakery from the first wave, and it looks like Andrea is the latest of the Friends to take to the water, sporting a hot little number. Introducing Kate, a completely new character who – for some reason – warrants having her own set! What’s going on here? Well, my guess is that LEGO wanted to mix things up a bit, by introducing new characters while avoiding too many duplicates of the main cast. Previously one had to buy the more expensive sets (e.g. Butterfly Beauty Shop) to get supporting characters. If that’s the case, this is a good way to go about it. You’re probably thinking I have a much more sinister suggestion, right? Well, I’m going to suggest that Kate was meant to be part of the original line-up, but got dropped because her hairstyle was too similar to Emma’s and Andrea’s. And here she is: not only back with a vengeance, but hoping she gets her own spin-off series for the trouble. 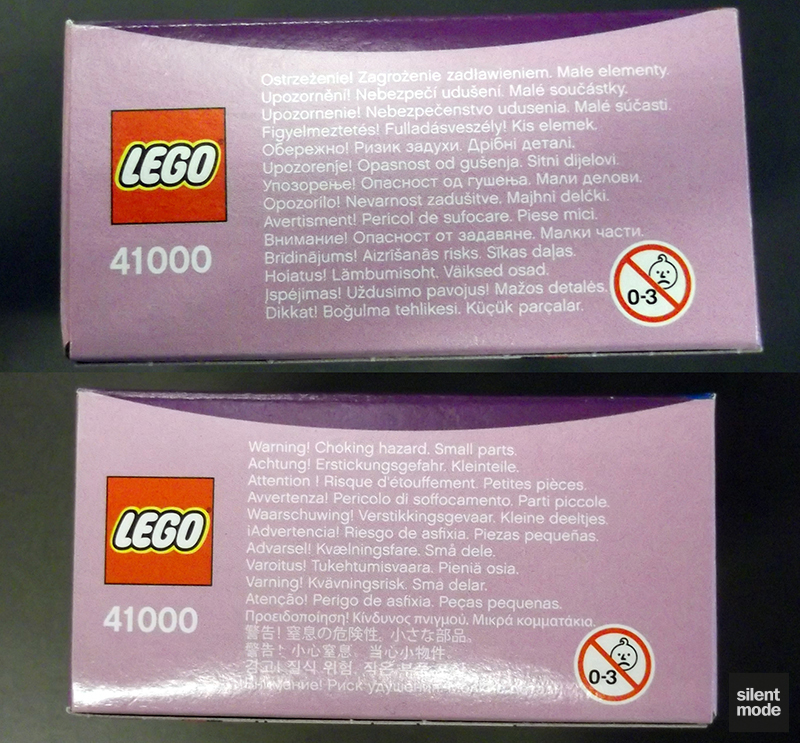 The other sides of the box don’t have anything flashy on them; just the usual warnings and a scale representation. In this case it’s a flipper piece: one of those easily forgotten parts. 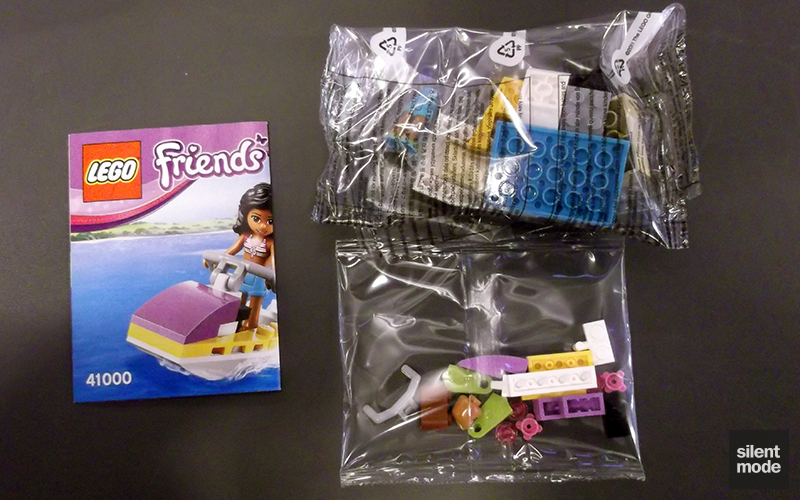 As we’d probably expect for a set this size, there’s two very small bags of parts and a folded instruction book. The set number, with its triple-zeros, really stands out. I also noticed on the instructions: the smooth rendered-style picture of the main Friends cast has been replaced with the drawing style. To me, at least, each of the Friends look much older and arguably more mature, almost like women approaching their twenties. Maybe it’s representative of them making way for a new main cast? Gewinne!th is back! Back by popular demand! Them fools thought she was done for, but no! I am rather curious as to what she did with those two no-names that temporarily replaced her…? 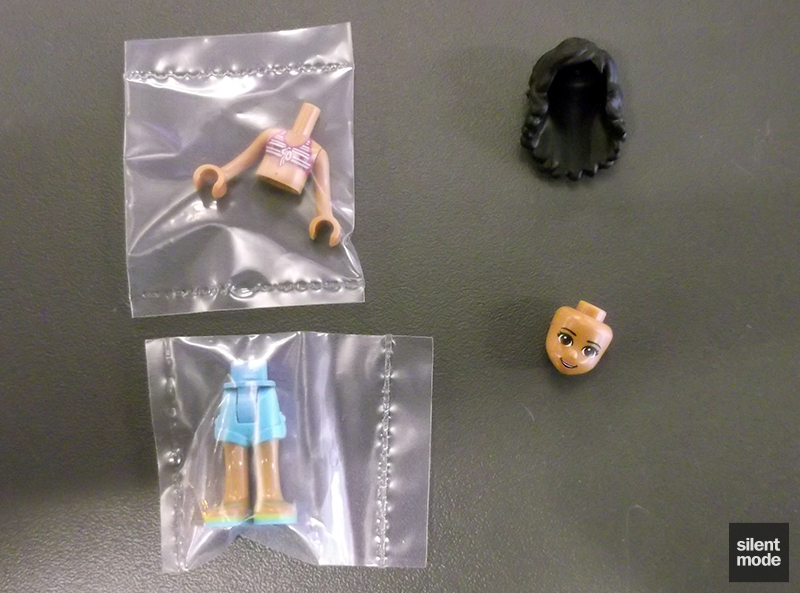 Let’s start with probably the most important part of the set: the minidoll parts. As with the other Friends, this one is divided into four parts, with the legs and torso sealed separately in small bags. Not much is known about Kate, except that – in my opinion anyway – she’s mixed-race rather than black, possibly from the Caribbean. Who knows? In any case, she’s very much at home on the water, and is likely to speak with an accent. Just from this minidoll and this set, I get the impression there are going to be many more minidolls to collect, if you’re into the idea of collecting all the minidolls (which I am). There are bound to be more interesting combinations of clothes and things further into the theme. 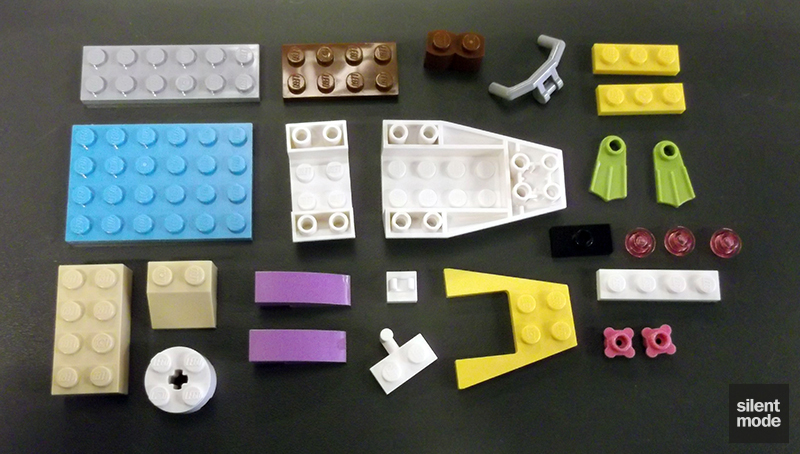 What you see here is all the other parts in the set, and it really is a small set. This set is now the least expensive way of getting hold of both minidoll handlebars and the 4×6 Medium Azure plate (both previously in Stephanie sets). 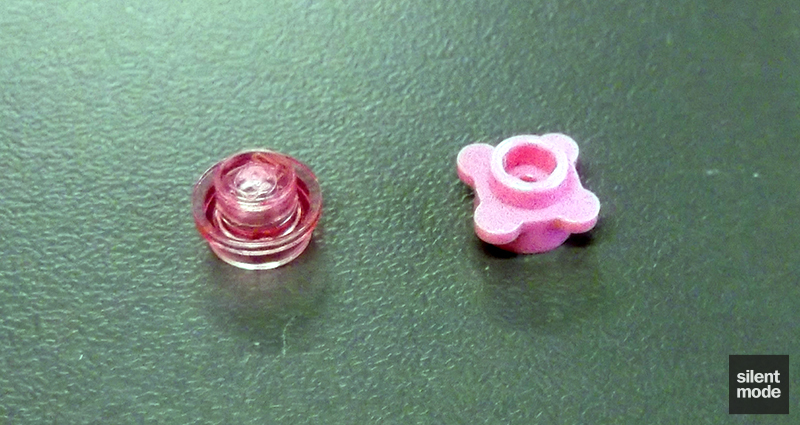 Although I usually get excited about 1×1 flower plates, they’re very common in Dark Pink. This is really going to be quick: two minutes at the most. It was so quick I was able to take all the pictures before the camera guzzled battery power. 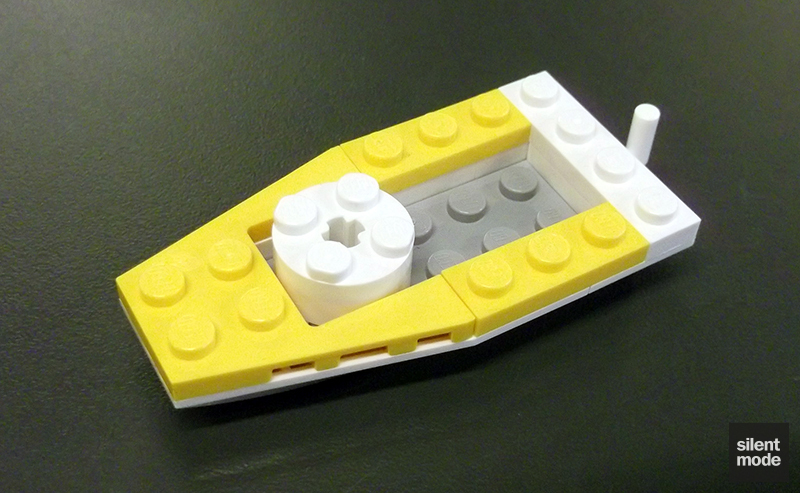 The first build is of this tiny pier setting, using only six pieces. While these tiny builds are usually useless to me, I couldn’t help but be impressed by how well this was constructed; it actually looks like a pier, albeit one a little too small to stand on. It’s probably better suited to a game set. As a coincidence, the previous night before buying this set, I watched a rerun of Baywatch: the episode highlighting the dangers of (then illegal) power skis. The water scooter begins life as many small water vehicles do: two boat pieces joined together by a 2×6 plate. We then add a yellow trim to hold everything in place, along with a hook at the back. 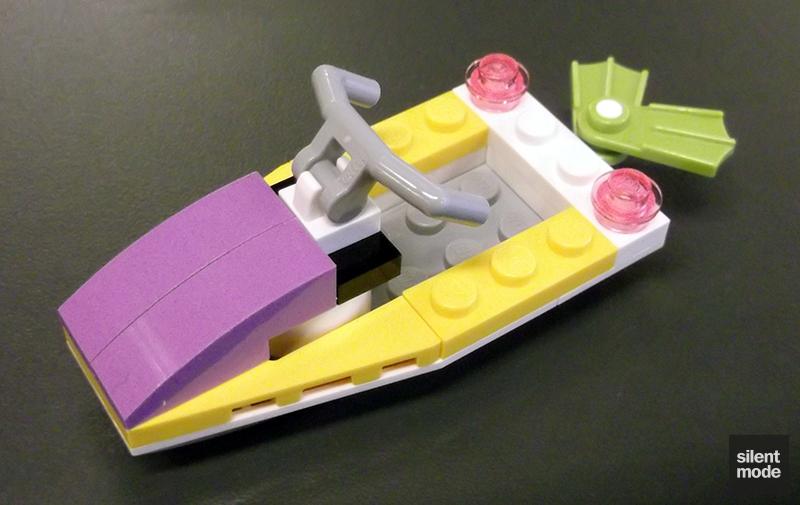 The rest of the parts flesh out the boat, adding controls, lights and a streamlined front. 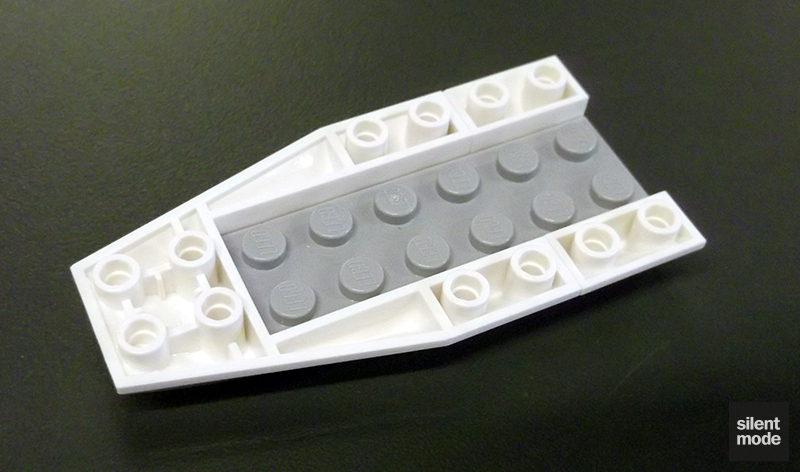 Most impressive of all – although a tight fit – is somewhere to put both of those useless flippers. Give Kate a wide open space, and she’ll scoot all over it in her little zippy power scooter. Not a bad little set to play with while waiting in the airport, I must say. Possibly the most useful set of leftovers I’ve seen in a set to date. Keep these for your collection, or feel free to add an extra flower to the pier – the choice is yours. I don’t have much to say about this set, except it’s a good opener to the third wave of Friends intended for 2013. The introduction of a new character was both a surprise and a nice touch; I’m wondering who else is going to show up. 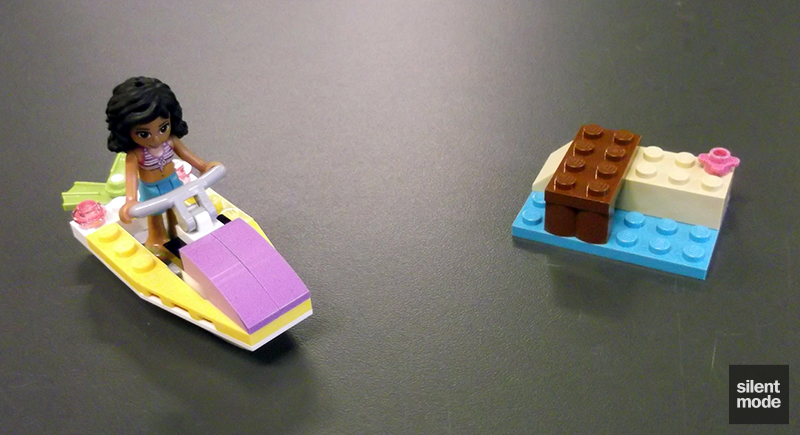 With regards to the water scooter: I didn’t find myself as inclined to swoosh it around as I did with Olivia’s speedboat, and it’s nothing we haven’t seen before in numerous polybags. There are other miniature vehicles in the Friends line-up, however, and I guess a small water vehicle had to be included at some point – why not in an inexpensive set? If you can get past the generic name of the minidoll, I’d say this is worth picking up to add one more character to your collection. Is it worth picking more than one of them up if they’re available? Unless you’re after Medium Azure plates or more minidoll parts, I’d say no. Impressed with the overall design of the small (even if useless) pier, and the long-overdue bikini and shorts outfit. The water scooter is okay but nothing new. As is probably expected, a very quick build that's near impossible to screw up. Kudos is given for incorporating a way to store those useless flippers. 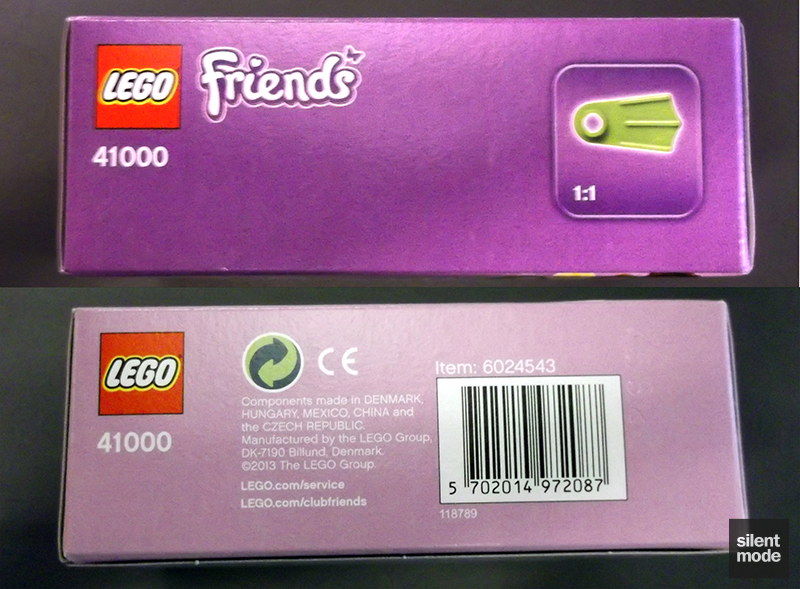 The parts selection is pretty much what can be expected for a set this price, but I'm still generally underwhelmed. 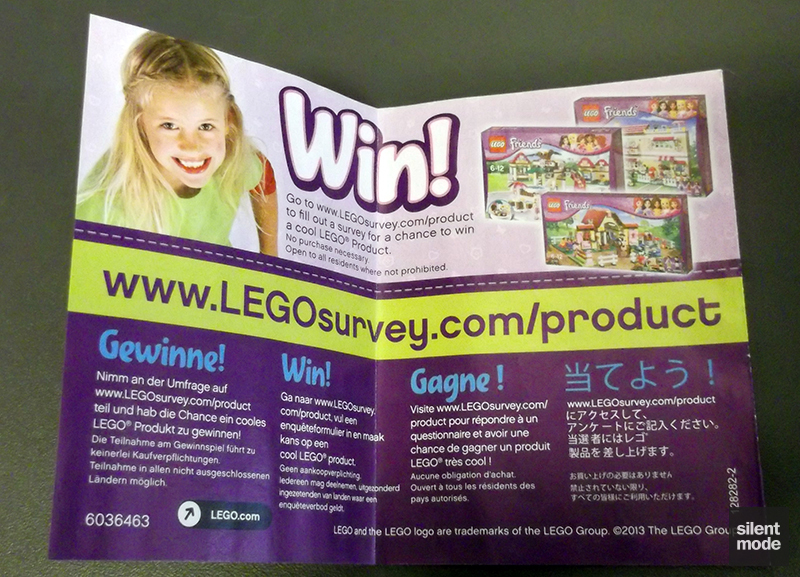 Most of the points are for a fresh new minidoll. Riding around on the water scooter is all we can really do with this set; it's not as appealing as rolling in a speedboat or even on the Stephmobile. A new character rather than one of the main cast softens the blow, but even at this price I'm not sure if it's worth it. Based on these, I’d give Kate and her water scooter 6.4/10. Stay tuned for reviews of the other sets I’ve picked up, as and when I have them ready.